Tattoos for Now is the largest company of its kind in Western Canada. Our artists have superior airbrushing skills and are able to blend colors effortlessly to create stunning, realistic tattoos that consistently delight our customers. 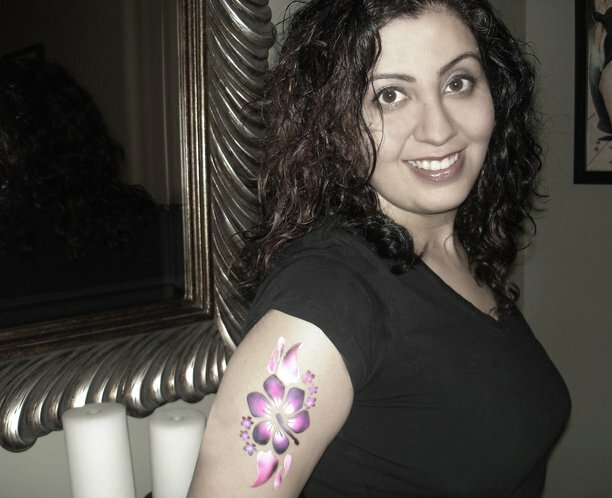 Our on-trend tattoo designs are applied using a Mylar stencil and airbrush gun. We use a specialized cosmetic paint that is safe and FDA approved. The paint is applied with an airbrush gun, resulting in a realistic looking, non-smearing and water resistant tattoo that dries instantly and can last up to seven days. Tattoos for Now offers a selection of over 400 designs organized into categories that include: “Cool Kanji”, “Canada Eh”, “Naughty Hottie”, “Girly Girls”, “Flower Power”, “Classic Ink”, “Trendy Tribals”, “What Does Mine Say?”, “For the Player”, “Bad Boys”, “Regal Eagles”, “Trendy Tribals” and much more. We add new designs each year to ensure that our selection of tattoos keeps up with the latest trends. We have designs that appeal to people of all ages and backgrounds. Individual and group rates start at $40 per thirty minute appointment. Three to four designs can be airbrushed in this time frame. For more information or to book an appointment, please email Nina at nina(at)tattoosfornow.com.